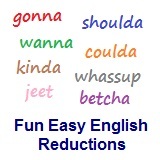 ﻿ Fun Easy English - new-american-english-reductions-reduced-words-topic-word-of-front-of-frunna. In this lesson you will learn the American English reduction frunna. Your shoes are in frunna the door. Your shoes are in front of the door. Your car is parked in frunna the store. The center lined up in frunna the quarterback. He tried to push in frunna her while she was waiting in line. She was completely naked in frunna the window. Put your shoes in frunna the entry. This American English reduction is often used in causal speech but you need to listen closely as the difference between "frunna" and "front of" is very subtle. Reductions, such as frunna are not real words in English.